2016-17: Ayeyarwady Integrated River Basin Management Project, Component 1: Water Resources Management, institutional review and options assessment study. 2015: Preparing the Uplands Irrigation and Water Resources Management Sector Project, Cambodia. 2014-17: Assam Integrated Flood & Riverbank Erosion Risk Management Investment Programme, Institutional Strengthening Component. 2012-14: Climate Adaptation and Resilience Planning, Cambodia. 2012-13: Pilot Program for Climate Resilience (PPCR), Cambodia, Phase 1, Components 1 & 2: Mainstreaming climate resilience into development planning at the national and sub-national levels. 2008-14: Managing water in Asia's river basins (ADB RETA 6470). 2007: Cambodia: IWRM-based river basin studies in Kratie and Kampot provinces. 2006: Study of water availability and livelihoods in the Boribo and Dauntri rivers in the Tonle Sap basin, Cambodia. 2000-06: Mekong Basin Development Plan (Cambodia, Laos, Thailand and Vietnam). 2002-05: National Capacity Development Project, Cambodia. 2002-03: Flood Management and Mitigation Programme for the Lower Mekong Basin, support during programme formulation and implementation planning. 2002: IWRM pilot studies in Cambodia, Laos and Viet Nam. 2000: Kok River Basin, Thailand. Multi-disciplinary natural resources and environmental management study. 1999: Mekong Basin Development Plan (Cambodia, Laos, Thailand and Vietnam), detailed planning phase. 1992-96: River Survey Project (FAP24), Bangladesh. This was one of the largest components of the national Flood Action Plan, which had a total budget of around 150 mio. USD. The project comprised hydrological and morphological mapping and analysis of the main rivers of Bangladesh. 1992: Kelani Ganga River, Sri Lanka. Water quality study of saline intrusion from the sea, threatening the water supply of Colombo. 1983: Marina Bay, Singapore. Hydraulic and environmental impact study for a reclamation scheme re-shaping the mouth of Singapore River. 1982-83: Thailand, rehabilitation of provincial waterworks. 2014-15: Integrated coastal zone management (ICZM) planning for Gulf of Kachchh, Gujarat, India. 2013-15: Vulnerability Assessment and Adaptation Programme for Climate Change within the Coastal Zone of Cambodia. 2001: Sri Lanka, Coastal Resources Management Project, Component B, Institutional Strengthening. 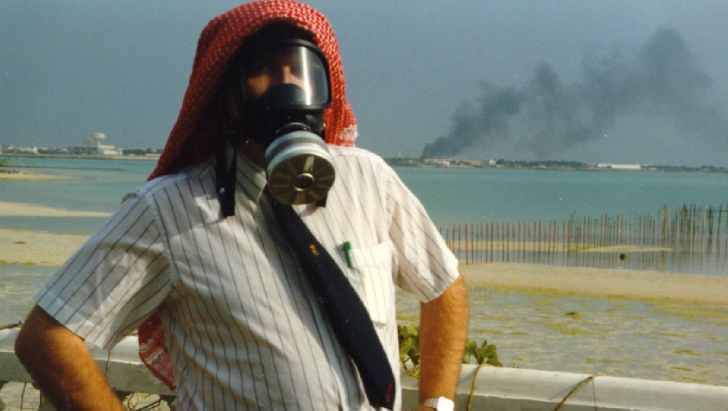 1998: Bahrain, cooling water recirculation study and marine environmental screening. 1995-98: Meghna Estuary Study (FAP5B), Bangladesh. Hydraulic engineering services in connection with a master plan study for the low lands of the mouth of the Meghna, where Ganges and Brahmaputra discharge into the Bay of Bengal. 1992-93: Masinloc Power Plant, The Philippines. Environmental feasibility and impact study with associated technology transfer to the host organisation. 1992: Kakinada, Andra Pradesh, India, coastal hydraulic study for a planned harbour. 1991: Barranco de Tirajana and Granadilla power plants, Gran Canaria and Tenerife, Spain. Site selection study. 1990: Venice Lagoon, Italy, environmental and morphological feasibility and impact study for the planned flood protection of the town of Venice. 1989-91: The Maldives, Male waste disposal study, marine investigations. 1988-89: Taichung Thermal Power Plant, Taiwan ROC. Cooling water disposal study, including recirculation, environmental impact, and hydraulic optimisation of a 380 m³/s sea water cooling system. 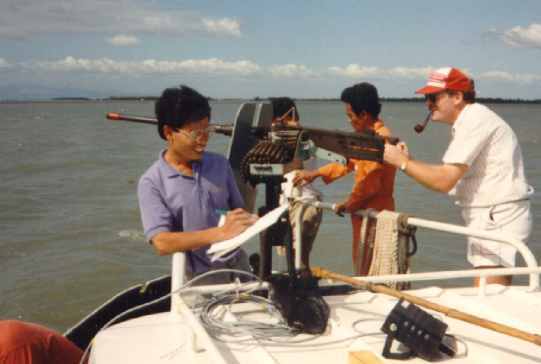 1987-88: East Coast Siltation Study, Singapore. Study of silt transport and harbour siltation. 1987-88: Keelung and Tamsui, Taiwan ROC, consultancy on environmental aspects in connection with planning of two large harbours on the north coast of Taiwan. 1985-86: North East Coast Reclamation Project, Singapore. Hydraulic and environmental impact study for a large reclamation scheme in Johor Strait. 1985-86: Ad Dur, Bahrain. Hydraulic and environmental design and impact study for a 10 mio. gallons/day reverse osmosis desalination plant, at that time the World's largest plant of its kind. 1985: East Coast Reclamation Project, Singapore. Hydraulic and environmental impact study for a reclamation scheme. 1984: The North Sea, operational oil spill forecast modelling. Development of a deterministic oil spill model for the emergency preparedness of the operators, with modules for prediction of wind, current, drift and weathering. 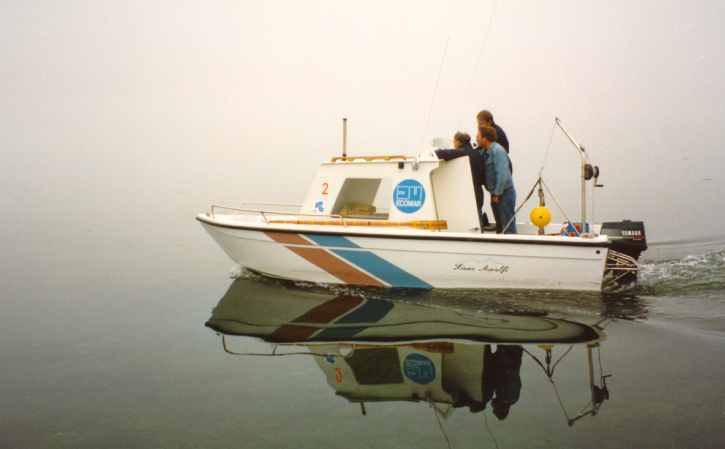 1982: Pontevedra, Spain, estuarine dye tracing as a part of an environmental study. Consultant: 1982: Puerto de Carboneras Power Plant, Spain, environmental and sedimentological study for a power plant and a coal import harbour. 1981-82: Marmorilik, West Greenland, field survey for a research project of estuarine circulation. 1981: Mecca-Taif Power and Desalination Plant, Saudi Arabia, hydraulic investigations for a planned power and desalination plant on the Red Sea coast. 1981: Yanbu, Saudi Arabia. Field surveys for a large industrial development scheme on the Red Sea coast. 1979: Narssaq, Southwest Greenland. Environmental hydraulic baseline study for a planned uranium mine at Kvanefjeld. 1978-79: Marmorilik, West Greenland. Environmental hydraulic studies of tailings disposal from the Black Angel lead and zinc mine. 1991: Jubail Power and Desalination Plant, Saudi Arabia, design modification of the 290 m³/s sea water intake of the Worlds largest desalination plant, in order to provide protection against oil pollution. 1991-92: Koggala, Sri Lanka, study of a planned ocean outfall for industrial wastewater. 1991-92: Costa de la Luz, Spain. Environmental feasibility and hydraulic design of 6 ocean outfalls on the Atlantic coast of Spain. 1990-91: Hsin-Ta power plant, Taiwan ROC. Planning and hydraulic design of the cooling water system for a 4200 MW power plant observing strict national environmental standards. 2008: DHI-NTU Water & Environment Research Centre and Education Hub, Singapore. 2007: Cambodia: Resource-based livelihood opportunities in commune development planning. Consultant: DHI, funded by Danida. 2006-07: China, formulation of a capacity-building sub-component of the planned 2nd Shandong Environment Project, formulation of a capacity-building conponet. 2005-06: Water Resources University, Hanoi, support to development of a new MSc course in water resources economics. 2003: Consultant for the 2nd Annual Flood Forum of Mekong River Commission. 2001: Asian Institute of Technology (AIT), Thailand, visiting research engineer, integrated water resources management (IWRM). 1995-2000: Surface Water Modelling Centre, Bangladesh. Short-term consultancies, funded by Danida. 1999: Coastal Zone Management, Cambodia, appraisal of a combined technical assistance and social development project. 1998: Flood Forecasting & Warning Centre (FAP10), Bangladesh. 1997: Zambia, Zimbabwe, Uganda. Consultant for seminars on environmental policy and management, organised by the national environmental agency and the World Bank. 1996-97: Kazakstan. Consultant for a seminar on environmental policy and management, organised by Ministry of Ecology and Bioresources and the World Bank. 1993-95: India, Bangladesh, Thailand, Sri Lanka, and The Philippines, research project (PhD study) on international technology dissipation, supervised by dr. phil. Erik Baark, sponsored by the Danish Development Research Board (Rådet for Ulandsforskning), Danida. 1994: The Caspian Sea, identification mission for an environmental conference. 1991-94: Lanka Hydraulic Institute, Sri Lanka, technological upgrading (Phase 3), comprising implementation of a suite of numerical models, and associated training in Sri Lanka and Denmark. 1995: PhD, Institute of Technology and Social Sciences, Technical University of Denmark, specialised in technological development in the Third World. 1986: Business Economist (HD), Copenhagen Business School (Handelshøjskolen i København), specialised in international economy and management. 1978: Business Economist (HD), Copenhagen Business School (Handelshøjskolen i København), specialised in organisation and public administration. 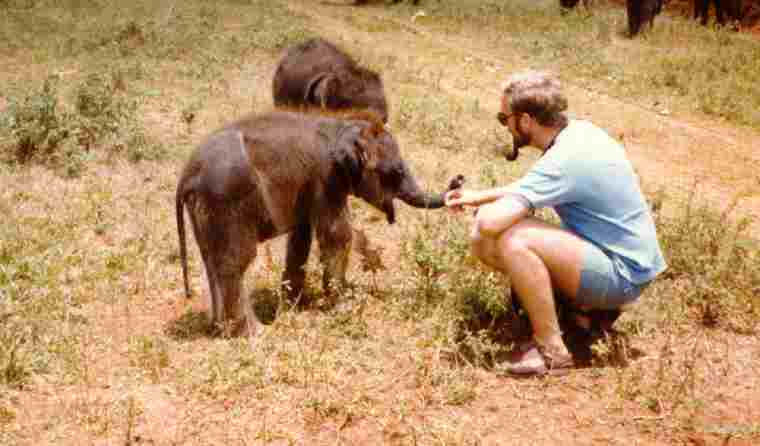 1974: Civil engineer (MSc), Technical University of Denmark, specialised in environmental engineering.